" shield " safety device like being behind glass doors or inset within a frame it might be hazardous. Someone tripping on a carpet or something might fall on the multiple knife points of grab for a sharp blade in an unthinking moment trying to stop the fall. At the very least the installation should take this into account: The way it is done might make the difference between something very safe and an accident waiting to happen. I'm assuming this means this particular arrangement is hung up on a wall with the blade points above head level. This would make tripping and grabbing things a non-issue. If that's the case is should be as secure as anything else. Thank you for the feedback. Yes, the idea is to mount the rack quite high on the wall, so the grips are at shoulder-level. This eliminates the potential hazard of someone falling on the pointy ends, and makes for a more pleasing display. I had always thought the opposite would be more dangerous - with points down, they might fall out of their holders and stab you in the foot. 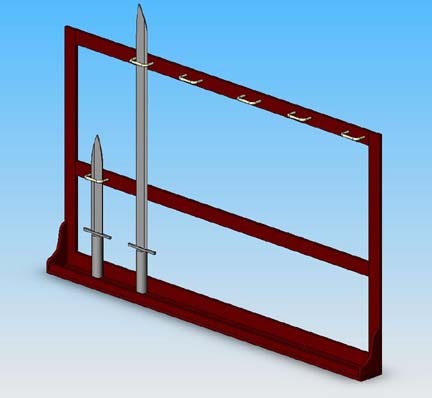 Also, in a points-down display rack mounted on the wall, you would be grabbing the sword by the blade to take it down, whereas in this one, you grab them by the grip. O.K. I'm convinced. It's all in the details and placement though. High and securely bolted to the wall. And I can see were point down might be worse when high up as the hand rising to get to the handle of a sword or a knife it might pass close to a point or many points. Hmmmm ...... Points up mount it high. Points down mount it low. My only concern would be someone grabbing a sword out of the rack too quickly, pulling outward in a forceful motion and causing harm to the blade. I did my own custom fabrication a while back... The only thing I would do different now is use a table saw (which I didn't have at the time) to run some grooves on the inside, and then mount some lexan or glass in it to protect the blades and make them safer. Oh my goodess......your armoury makes me all hot n' bothered! Yes, this is one of the few cases where it's OK to say that to a guy. The other is for rackmount computers. Posted: Mon 23 Apr, 2007 7:21 pm Post subject: How to display a sword collection. Wow. I didn,t expect any replies for a few days. Thanks to all of you so far. I did try to send a picture of what I am using now but it wouldn't go through. I'm afraid I am fairly new to computers as well as sword collecting. You certainly make a fellow feel welcome. Thanks again.